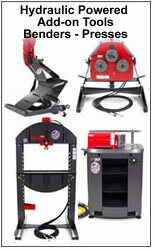 The 40 Ton Edwards Ironworker supplies enough hydraulic power for many small shop functions. The punch can penetrate a 1/2 inch thick piece of steel with an hole up 1 inch in diameter. There are two shear stations, one for angle and one for flats. There is an open station, which would allow for the addition of a coper notcher or other optional tooling. 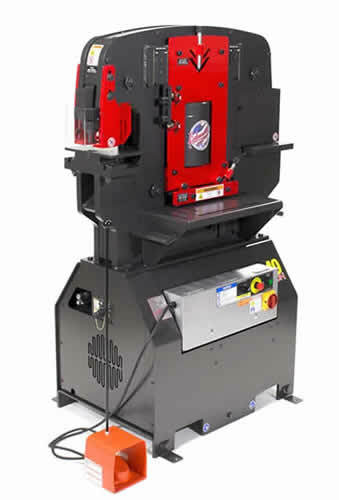 This is the smallest Edwards Ironworker that can accommodate the ** Powerlink System. Call me, Jason, at 1-800-748-9068 and get your best quote here, now! I can save you some trouble and give you an awesome deal. 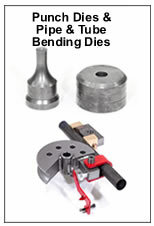 Pedestal Die Table Punch an attachment for the punching of flange/web surfaces of 2" steel angle, channel & beam. The punch on this unit can do 1" dia. in 1/2 steel! Angle Shear cuts both thin and thick steel angle, This unit can cut 3 x 3 x 1/4 angle.inch.